What Is DA Form 4037-E? 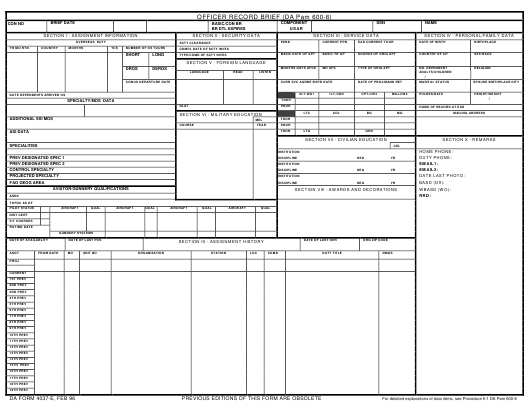 DA Form 4037-E, Officer Record Brief is a standardized one-page summary of qualifications and career history filled out by Individual Ready Reserve (IRR) Officers, Individual Mobilization Augmentee (IMA) Soldiers, and Warrant Officers. The DA 4037-E is filed and stored electronically. The information provided in the form should be annually updated by the Officer. Resource Managers are responsible for assisting Officers with their annual review. The lack of an Officer Record Brief (ORB) in an Officer Master File (OMF) is often interpreted as a lack of interest in a promotion. The latest edition of the form - sometimes incorrectly referred to as the DD Form 4037-E - was released by the Department of the Army (DA) in February 1996. An up-to-date DA Form 4037-E version is available for digital filing and download below. Except for manually entered information, the form collects data from a number of sources. These sources include the Army Training Requirements and Resource System (ATRRS), the Department of the Army Photograph Management System (DAPMIS), the Defence Enrollment Eligibility Reporting System (DEERS), the Keystone System, the Medical Protection System (MEDPROS) and the Standard Installation/Division Personnel System (SIDPERS). How To Fill Out Da Form 4037-e? The information for the ORB is sent by the Officer's superiors to the United States Army Military Personnel Center (MILPERCEN) via Standard Installation and Division Personnel Reporting System (SIDPERS) and into the OMF. Some data is provided by the HQDA. Certain data - including religious preference, the number of dependents and marital status - is manually reported by the Officer. The Officer is required to annually review their ORB, annotate corrections and provide their signature and date. A copy of the previous record can be obtained directly from the HQDA by a written request, which should include the name, grade, SSN, branch of service or functional area or MOS, mailing address and signature. The request should be sent to HQDA (ASNI-SMC), ALEX, VA, 22332-0400. When reviewing the DA Form 4037-E the Officer should check each item and report any omissions, errors and new changes to the Personnel Center. The Personnel Center will submit a SIDPERS transaction or send a letter to the appropriate HQDA office to update the OMF. In some cases, the officer will be requested to provide proof for the proposed changes if the associated information is not available at the Personnel Center.